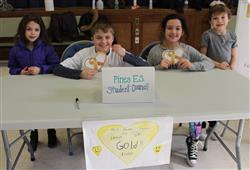 Pines students participated in an Arts in Education Zumba program March 26th - 29th in all Physical Education classes. This program was led by Jeanine Ekclund "The Zumba Lady". Zumba fuses Latin rhythms with easy to follow dance and exercise moves. The students, along with physical education teachers, Mrs. Barbieri and Mrs. Kunzig, had a blast moving to this energetic music! During the week of March 18th, we celebrated our annual Respect For All Week here at Pines Elementary School. Respect For All week consists of a variety of building-wide activities to promote the themes of treating ourselves and others with kindness and respect. Some of these activities include “Mix It Up At Lunch” day and our “I Can, You Can, Be A Good Friend” canned food drive for the Long Island Cares Harry Chapin Food Bank. This year, our Respect For All Week ended with a wonderful assembly presentation by Mr. Rohan Murphy, entitled “Success For Every Student.” Mr. Murphy’s story is a compelling one, with themes of grit, perseverance, inclusion, and respect. We were truly very lucky to be able to spend time hearing about Mr. Murphy’s life and many students reported that they found his story to be inspiring! 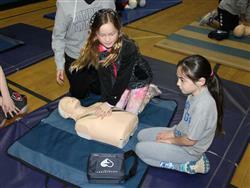 On March 21st Pines 5th grade students had the opportunity to learn Compression Only CPR and had an introduction to AED use by Mrs. Acompora and staff, from the Louis J. Acompora Memorial Foundation. This foundation has been instrumental in raising awareness among schools, sport venues and other public institutions about the importance of owning automated external defibrillators(AED) to be better prepared to respond to sudden cardiac events. Pines 5th grade students were able to practice performing compressions and using an AED machine on several "Rescue Annes", which were in the form of a human head and chest. In addition, Mrs. Acompora demonstrated how to perform the Heimlich Maneuver. This program was extremely informative and the students were eager to participate in learning valuable life saving skills! For 3 weeks prior to the February Winter Break, the 3rd, 4th and 5th grade students at Pines ES participated in a Volleyball Unit. With the help of Mrs. Barbieri and Mrs. Kunzig, the students worked hard learning and practicing the skills related to the game of Volleyball. The students also had the opportunity to be a part of a team and experience working with other students in their class. The unit concluded on February 15th with our annual Pines Volleyball Tournament. Congratulations to all students who participated and to the winning teams: Grade 5 - The Kings of Volleyball, Grade 4 - The Yetis and in Grade 3 - Strikers. Click on the title to view pictures from this event. Pines Career Day was held on Friday, February 1st and was the final day concluding Pines College and Career Week. The day was exciting for all 4th and 5th grade students as they had a day full of listening to many exciting careers presented by parent volunteers. Some of the careers presented were a veterinarian, chef, probation officer, attorney, ice company, and physical education teacher. Many thanks to all of the presenters for sharing their careers with out students! Click on the title to view photos from this event.